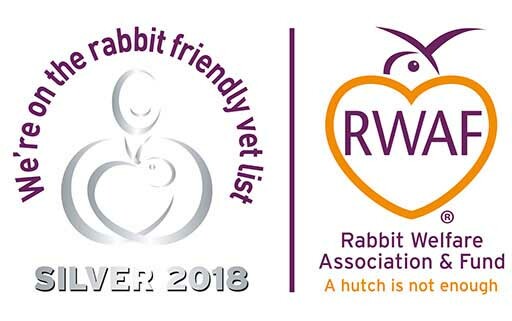 We have a Silver award as a Rabbit Friendly Hospital. We understand that rabbits will find the whole experience of visiting the vets very stressful and therefore we are committed to doing what we can to minimise this stress as much as possible. rooms that allow rabbits to be completely separate to any predator species whilst they wait to see the Vet or Vet Nurse. We are constantly reviewing and updating our anaesthetic protocol as we understand this carries a slightly higher risk than in cats and dogs. We use quiet fur clippers and Emla local anaesthetic cream, before routinely placing an intravenous catheter so we have access should it be required urgently. We continuously review our pain relief protocol for rabbits. Being prey animals, they are very good at hiding their pain and we understand the need to recognise the signs as early as possible and administer the correct pain relief as required by the individual rabbit. We do ask that you bring the rabbits own food in with you so as not to upset their delicate digestive system during their stay. Keeping thing familar for them also helps to reduce stress. Our Pet Care Monthly scheme allows you to save 27% on your essential healthcare package! Vaccinations are available to protect against myxomatosis and rabbit viral haemorrhagic (strain 1 & 2) disease. Both are fatal diseases which can affect indoor and outdoor rabbits. 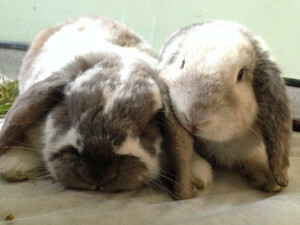 Myxomatosis vaccine can be given from 6 weeks of age. It is recommended to give the vaccine annually in April / May as myxomatosis is most prevalent in the summer months. Where there is a high risk of myxomatosis a second dose should be given 6 months later. Rabbit viral haemorrhagic disease vaccine can be given from 12 weeks of age. An annual booster vaccine is needed to maintain immunity. The myxomatosis and rabbit viral haemorrhagic disease vaccines cannot be given on the same day and should be given at least 2 weeks apart. A combined vaccine for Myxomatosis and Viral Haemorrhagic Disease is available which can be administered from 8 weeks old and lasts one year. This is also cheaper than the previous use of the separate vaccines. RHD2 is a relatively new strain of the disease seen in the UK. We recommend you also get your rabbit vaccinated against this strain as it is highly contagious and can result in sudden death with little or no symptoms prior to this. This vaccine needs to be given at least 2 weeks following the first RHD vaccine, and generally requires an annual booster. Ferrets can be vaccinated to protect them against distemper. There is no licensed ferret vaccine available in the UK but part of a dog vaccine can be used. The vaccine can be given from 12 weeks of age. It is usually given annually, though some people prefer to give it every 6 months.